From a young age I was introduced to what are still two of my favourite movie franchises of all time – Star Wars and Indiana Jones. I suppose it was inevitable, really. With parents who named me after a Doctor Who character, I would expect them to continue being awesome as I grew up. You may notice that my last name is Jones. If you check out my profile you’ll also see that I majored in history and have a Masters in Museum Studies. Coincidence? Hell no. Indiana Jones was the original inspiration for my academic life choices and I still have every intention of becoming Doctor Jones one day. Mostly for the lols. Imagine the surprise my seven year old self had when watching Temple of Doom and noticing that the establishment that Indie, Short Round and Willie just escaped from is named ‘Club Obi Wan’? To be put it delicately, my brain nearly exploded. I also couldn’t understand it when my other little girlfriends didn’t care. It’s okay, we’re no longer friends. I found their lack of faith disturbing. As it turns out, they’re a lot more crossovers between the Star Wars and Indiana Jones movies than this one Jedi Master easter egg. So we’re at the beginning of the movie. Indie has just escaped from the infamous rolling boulder, golden idol in hand. He reaches the river bank and swings across a conveniently placed vine to his awaiting sea-plane. If you look closely, you can see that the plane’s serial number is OB-CPO. A subtle but undoubtedly purposeful reference to Obi Wan and C-3PO. 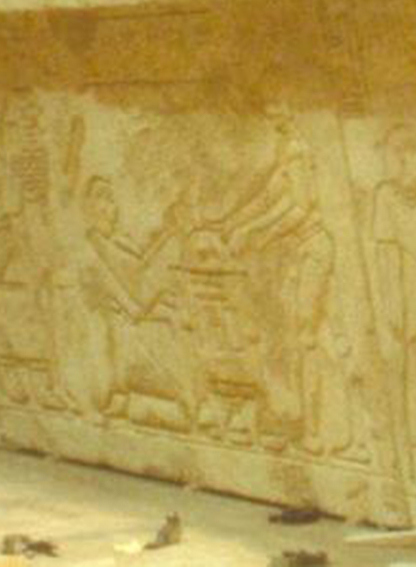 When Indie and Sallah (John Rhy Davies) are preparing to remove the stone lid off the sarcophagus of the ark, the viewer is privy to a wall of hieroglyphics behind them. One of these is a depiction of Princess Leia inserting the Death Star Plans into R2-D2. This appearance occurs mere moments after the one above. Indie has just lifted the lid off the sarchophagus and turns around to look at the pillar behind him. Lo and behold there are hieroglyphic versions of C-3PO and R2-D2. I must say that I appreciate the amount of R2 love in this movie. For those of you who skipped my incessant rambling and got straight to the easter egg list, this reference can be found at the beginning of the movie. Indie, Short Round and the ever unpopular Willie have just escaped a nightclub in Shanghai. As their car speeds past the front of the establishment you can see that it’s called ‘Club Obi Wan’. Okay, so this isn’t so much an appearance of a character as it is a homage to Star Wars itself. At one point during the movie Indie utters the classic line “I have a bad feeling about this.” The line itself (or variations thereof) is somewhat of a running gag in the Star Wars films, having been spoken by Han Solo, Obi Wan, Leia, C-3PO, Luke and Anakin at various times. During a scene on Coruscant where the camera is panning to look at the busy air traffic, one can spot a couple of familiar looking vehicles – one of which is the Nazi tank from The Last Crusade. During the podracing scene there is a point where the camera pans to crowd you can see Indiana walking to his seat. This little gem can be spotted at the beginning of the movie when the main characters are still on Hoth. If you look closely at Han, you will see that on the left side of his utility belt he’s wearing the bullwhip that would be made famous by the Indiana Jones trilogy. Now I can hear some perceptive readers say “But Tegan, Raiders of the Lost Ark hadn’t even been filmed, let alone released yet.” Right you are! Raiders wasn’t released until a year after Empire, in 1981. However, Lucas had already written the story and already had both the bullwhip and Harrison Ford in mind. This wasn’t the only time that Lucasfilm included preemptive easter eggs within the films – they would often include references to upcoming franchise games also. This sacred item turns up when our heroes are in Cloud City on the planet of Bespin. During the incinerator room scene you can see a pile of junk in the background. Amongst the garbage is the iconic wooden box that the Ark is placed into at the end of Raiders. The big giveaway is the Nazi eagle that is printed on the side. That’s it folks, I hope you’ve enjoyed my Indiana Jones/Star Wars nerdgasm. I also hope that it’s inspired you to rewatch the movies and find these delicious easter eggs for yourself. Sure, you could Google them instead, but where’s the fun in that? Star Wars has an overabundance of easter eggs across both trilogies. Here are some of my other favourites, and particularly geeky ones, all from The Phantom Menace. Seriously, that movie as basically one giant easter egg. During the aforementioned Coruscant skies scene, you can see the Voyager from Star Trek flying past. During the senate scene on Coruscant you can see a group of E.T. style aliens sitting at the bottom left of the screen. There are also a group of Klingons, but they’re slightly harder to find. During the podracing scene, Indie isn’t the only famous face in the crowd. If you look closely enough, you may just spot Manny – the main character of the cult hit Grim Fandango. Unsurprisingly, it’s a Lucasarts game. If you look even closer you may even see Cornelius and Zira from Planet of the Apes. There’s a shout out to 2001: A Space Odyssey when C-3PO is initially activated by Anakin. His first words are “I am completely operational, and all of my circuits are functioning perfectly.” This is, of course, an exact line used by the ever terrifying HAL 9000. I hear this one all the time and it is incorrect. Leia is NOT being held in detention block 1138. She is being held in detention block AA23 (as mentioned by C3PO earlier). @Mal: Just watched and confirmed. Luke says the prisoner transfer is from block 1138. After the fight, Han tells Luke, Leia is in cell 2187. Why aren’t there more pictures showing the scenes? @James: Copyrights mainly. I believe it would be fair use, hence the one blown up grainy picture. However, in general I avoid posting any pic where I don’t either own the copyright or have explicit rights from the copyright holder. In this case, I don’t for any of these pics, though, as I said, I *think* this falls under “fair use” so probably would have been fine, which is why I went ahead and posted the one. But as Disney and Lucasfilm before them tend to have a reputation for being heavy handed on perceived copyright violations, I didn’t want to push my luck even if it is fair use, which I believe it is. So instead, Tegan encourages you to watch the movies (which Disney certainly can’t complain about ;-)) or Google for the pics. I really have to question your interest when you don’t know how to spell Indy. The hieroglyphs in “Raiders…” I remember seeing in the theatre at the time. The rest are new to me, thanks! @Vince – you would question a persons interest after they put forward a very well written article about a subject they’re clearly well versed in, simply because you think ‘Indie’ should be spelt differently? Possibly one of the most trivial comments I’ve ever seen. @Nathan Agreed. Besides, women sometimes make things more personal, maybe to her Indiana is “Indie”. Besides, you gotta love her sense of humor, my kind of woman. “I find their lack of faith disturbing.” Hahaha, classic. Great list – appreciate you taking the time to compile it! Another Easter-Egg – While not related to Star Wars, in Kingdom of the Crystal Skull – there is a carving of E.T. in the Alien’s throne room at the end of the film. When the room begins to fall apart – you can catch the E.T. carving at the base of one of the skeleton thrones. Look for it next time you watch it! Again, cool list and I’ll be sending the link to some Star Wars fans and people who love Indy. The *next time* we watch Crystal Skull? Man, I am STILL trying to sear the nightmares from my brain from the first time I watched it. Burn all copies and move on. Being pedant: the tank in “the last crusade” wasn’t of german origin (rather a copy of a british WWI tank). It was use by the “nazi” in the film after the sultan gave it to them. First of all, props to your parents for naming you Tegan. Second… My only issue is with the Empire bullwhip theory. Tom Selleck tried out for the role and they even filmed some scenes with him. They originally wanted Dennis Hopper. Hopper was a lush and lost the part to Ford. So to say they had him in mind at the time may not be true. I love both of these movie series and what I enjoyed most about the article was the writer’s enthusiasm and very cute nerdiness. Tegan is a cool name! There’s a great Star Wars easter egg in Close Encounters of the Third Kind. As the mothership appears to rise behind Devil’s Tower, the camera cuts to a close-up of the ship and there, for a moment, is an upside down R2-D2 attached to the side. It’s obvious once you know to look for it. I don’t think that bullwhip in empire was a nod to Ford playing Indy. Tom Selleck was actually their first choice for an actor to play Indiana Jones. Wow. I may not know that mutch about Indiana Jones, but I do know Star Wars, and that is cool. Ok, while we are all needing out with the movies, I wanted to pose a question. Has anybody else caught what Obi-Wan instructs R2 when reporting back to Jedi headquarters from the Cloner planet in Episode 5? He tells R2 to send the message to the Jedi Council in”care of the Old Folks Home”. Loved it! Can I just mention , when the engines are failing in the cargo plane it’s the same failing sound as the millennium falcon. Crazy theory I recently heard… What if the ENTIRE Indiana Jones story is just the dreams of Han Solo when he’s frozen in carbonite?